When the weather’s bright take these fruity favorites al fresco and cook on the bbq. Mix the herbs, lemon juice, olive oil, garlic and some seasoning, add the lamb and turn to coat it in the marinade. 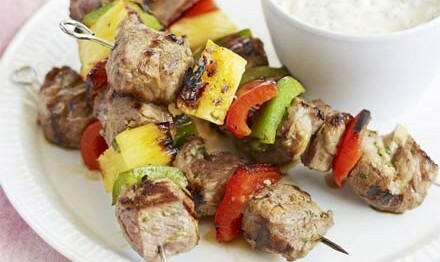 Thread the lamb, peppers and pineapple onto 8 metal skewers, alternating the ingredients as you go. Heat the barbecue or a griddle pan to hot, then cook the skewers for 8-10 mins turning frequently. Meanwhile mix the mayo with the chilli, coriander and lime juice. Season and serve with the kebabs.